It’s autumn in the north woods and I love everything about it! The leaves are spectacular. Leggings and boots are in effect. Warm soups and chilies are back on. Our family celebrates the season with an annual hay ride at my grandparents, complete with potluck dishes and a bonfire. Sometimes, we even throw in a shrimp boil for good measure. 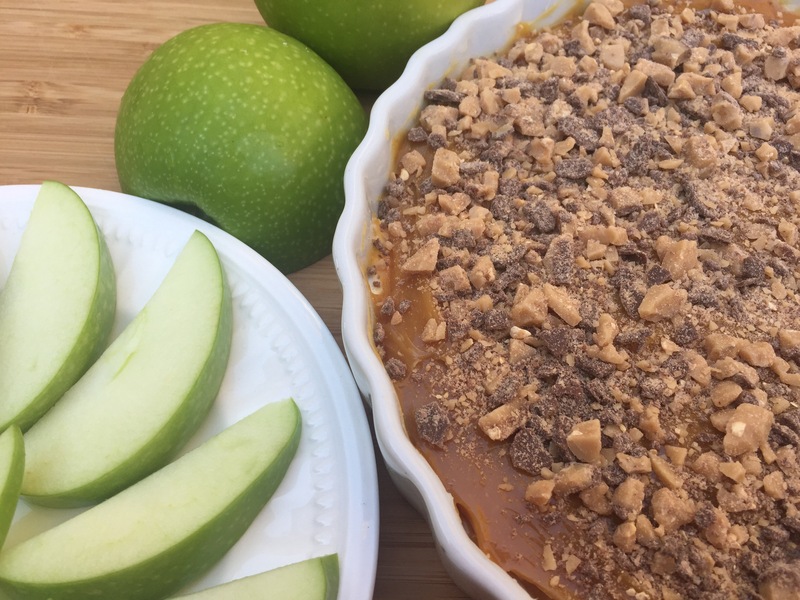 My dear sister Amy is always finding yummy recipes to share at events and a few years ago, she brought this delicious Caramel Apple Dip to our hay ride. I’ve been craving it and decided I had to have it this past weekend. It is the perfect dish to share at your next fall event! It’s also easy to make and contains 4 simple ingredients, plus your favorite apple for dipping. It reminds me of biting into a big caramel apple as a kid. (Such a treat!) But it has the added bonus of creamy goodness and my favorite Heath candy bar. (So. Much. Toffee. Goodness.) I love the combination of sweet and tart! I use Granny Smith apples but I encourage you to pair with your favorite. Enjoy! Thanks to Crumbs and Chaos for the perfect fall treat!